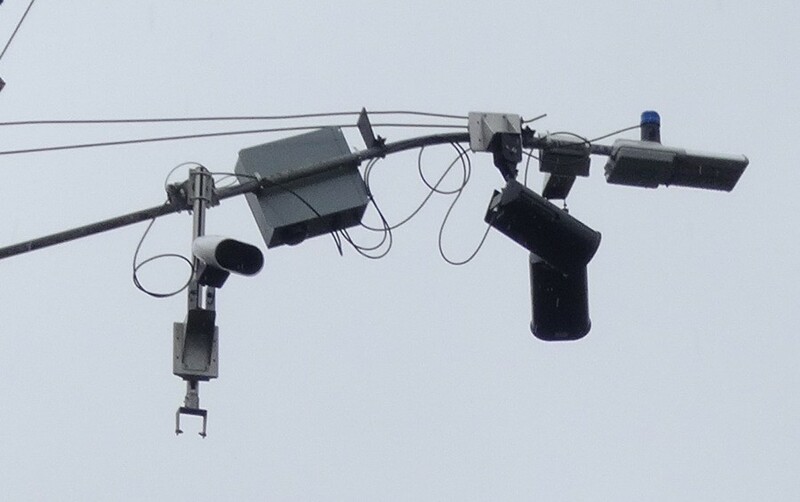 A license plate reader camera array in the city of Piedmont in 2014. The American Civil Liberties Union of Northern California filed a lawsuit against Immigration and Customs Enforcement (ICE) yesterday demanding public records related to the agency’s interactions with Automated License Plate Reader (ALPR) databases. The lawsuit alleges that ICE has “wrongfully withheld” the records, such as contracts, training materials, audits, and communications, which were requested through two separated Freedom of Information Act requests back in March. “Access to information about ICE’s use of ALPR databases is necessary to inform meaningful public debate over the scope of government conduct that potentially threatens core civil rights and liberties protected by the constitution,” ACLU states in the complaint. Earlier this year, ICE entered into contracts with two private companies to access APLR databases. ALPR systems consist of cameras and image processors that connect to a central database, which identifies and records every license plate in view. While law enforcement officials claim that this technology is critical for criminal investigations, advocacy groups argue that, by tracking a vehicle’s location over time, an intimate and invasive portrait of an individual’s daily life can be determined. “We really think, overall, license plate readers are a form of surveillance technology that poses a real risk to the way that people live their lives,” said Vasudha Talla, one of the ACLU staff attorneys who filed the initial complaint. She added that the organization believes ICE is using the technology for the purposes of targeting individuals and conducting civil immigration enforcement. Ultimately, Talla said, the reason behind the FOIA request and subsequent lawsuit is to gain a clearer understanding of how ICE is using the data. Talla said that the issue surrounding ICE’s access to ALPR databases is reflective of a broader trend in surveillance technology: communities approve systems for a specific reason only to have the technology repurposed for other, unexpected activities. News organizations and advocacy groups around the county have revealed just how valid the concern is. In places such as Illinois and Texas, ALPR systems are now being used to identify individuals who haven’t paid traffic and court fines. Closer to home, the Electronic Frontier Foundation filed a Public Records Act request with the Oakland Police Department for eight days’ worth of ALPR data in 2015 and, after analyzing over 63,000 data points, showed that license plates in low-income communities of color were more likely to be recorded. Adam Schwartz, a senior staff attorney for EFF, said that license plate readers are a concern for privacy advocates everywhere, and believes that the current issue with ICE is the product of two larger themes: the government using “Orwellian technology” and a growing emphasis on deporting undocumented immigrants. “Those two themes have increasingly been coming together, but the government has been opaque as to what is happening,” he said. Last January, EFF published an article revealing that one ICE office — via its investigative arm, Homeland Security Investigations — has access to ALPR data collected by more than a dozen Californian police departments through a third-party data broker known as Vigilant Solutions, LLC. Vigilant Solutions is a Livermore-based company specializing in “security software and services,” according to documents filed with the California secretary of state. The company has been in the spotlight since it was revealed in January that it received a contract with ICE granting the agency access to its ALPR database. In response to the public outcry over this collaboration, cities around the Bay Area began severing ties with the company. In February, the Alameda City Council voted to withhold a $500,000 contract intended to purchase Vigilant’s ALPR technology. A month later in March, the San Pablo City Council voted to delay purchasing more than 50 ALPR scanners. And, earlier this month, the Richmond City Council passed The Sanctuary City Contracting and Investing Ordinance, prohibiting the city from doing business with companies that provide data or vetting services to ICE. The ordinance’s passage means that, while Vigilant Solutions is currently doing business with the city, it is unlikely the company’s contract will be renewed. Other cities, including Oakland and Berkeley, are considering similar ordinances. “The government is using license plate readers to document, pervasively, where people are when they spend time in public, and it’s an intrusion on the privacy of everyone,” Schwartz said, adding that it is concerning ICE might be using the data to target and deport people from immigrant communities. He said that, ultimately, the federal government needs to do a better job explaining its use of ALPR data. “Sometimes you need a lawsuit to force them to explain themselves,” Schwartz said.